The eighth in a series of artist's projects designed for Art in Print. 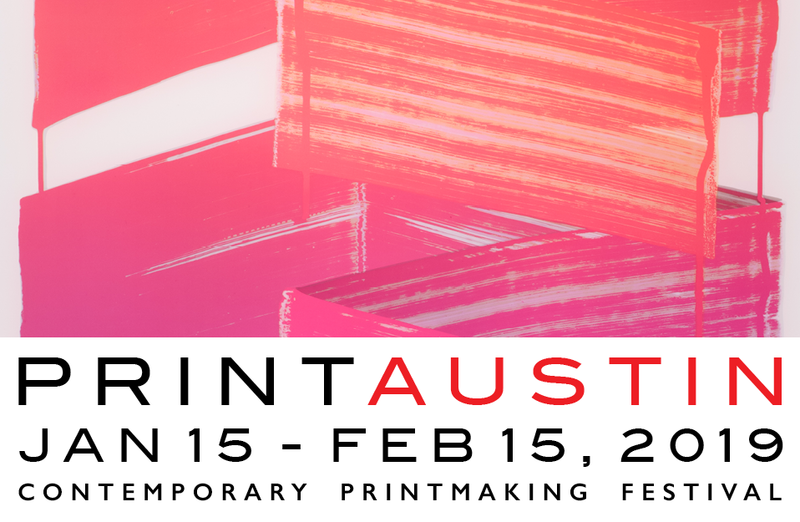 The sixth in a series of artist's projects designed for Art in Print. The fifth in a series of artist's projects designed for Art in Print. The third in a series of artist's projects designed for Art in Print. 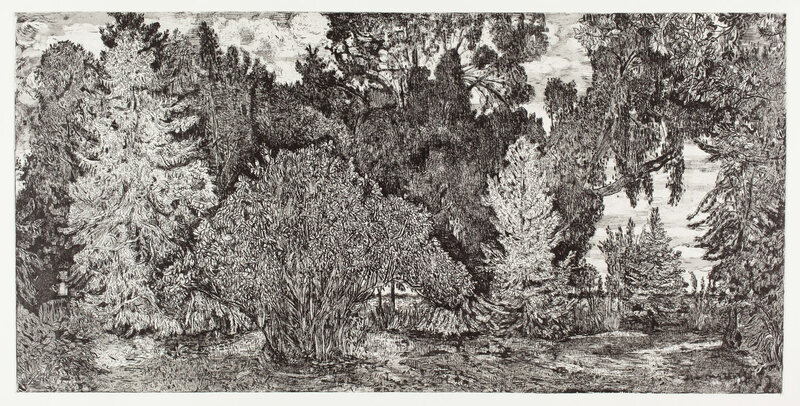 Nancy Friese, Still Grove (2016), soft ground etching with aquatint, drypoint and roulette, image 24 x 48 inches, sheet 30 x 54 inches. Edition of 20. Printed and published by the artist, Providence, RI. Courtesy of the artist and Cade Tompkins Projects. Assistance by Peter Pettengill, Wingate Studio, Hinsdale, NH. Art in Art in Print is an irregular, ongoing series of projects in which artists create art within the journal—not a piece of art that exists somewhere else and is reproduced in the journal, but a project designed specifically for the material, technological and social context of Art in Print. 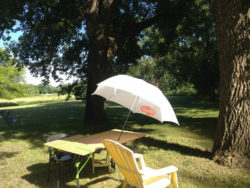 We are pleased to present Nancy Friese’s Still Grove as the fourth of these projects. A sense of the local is central to Nancy Friese’s work, which documents places and events that are specific and personal, while offering them up to be shared by the viewer. Friese is a landscape artist, and though she lives and works most of the year in Rhode Island, she spends several weeks each summer in rural North Dakota on the land her great-grandfather homesteaded when he immigrated from Norway.1 It is land she has drawn again and again, depicting its expansive fields and seemingly endless skies, sometimes in vivid paint and sometimes in intimate etched lines. A view of Nancy Friese’s North Dakota backyard with the copper plate under protective cardboard. After returning to the East Coast, she continued to develop the image through subsequent states—etching and proofing the plate (in collaboration with Peter Pettengill at Wingate Studio in New Hampshire), reapplying soft ground, then laying her drawing overtop once again. She changed the nature of her drawing implements with each state, so as to be able to recognize what she was adding at each stage—pencil was followed by blue pen, red and orange color pencil, and finally black pen. Meanwhile the backside of the paper grew denser and denser with the brown soft ground that adhered to it with every mark. In the last stage of development she worked the plate directly with aquatint, drypoint and roulette. The image thus exists in five places: the front of the paper sheet that bears her marks in pencil, color pencil and pen; the back of the sheet, where those same marks collected soft ground, pulling it from the plate; the copper plate, where the lifting of the ground left openings for acid to eat the metal; the printed etching, where ink has been transferred from those bitten marks in the copper; and this journal, where these iterations are brought together, via photography and digital printing. 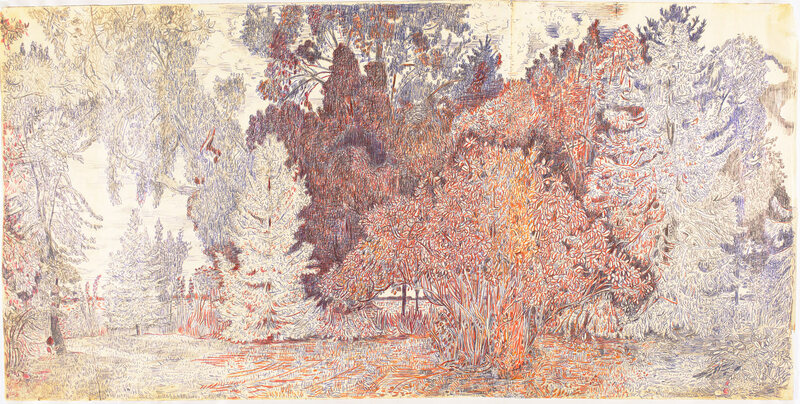 The image shows a wooded grove densely enveloped in bushes and trees. A small opening at right suggests the sort of place one might find a pleasant surprise while walking in the country, a private spot that invites time spent alone. Grainy soft-ground marks and finer lines of drypoint delineate the leaves and branches of the foliage, expressively but with precision. The degree of detail allows us to distinguish the variety of plant life, from flowering bushes to coniferous trees, inhabiting this snippet of land. The sky is glimpsed only in patches through the vegetation, and the cool black of the ink, like the earthy brown of the soft ground, reinforces the shadowy lushness of the scene. 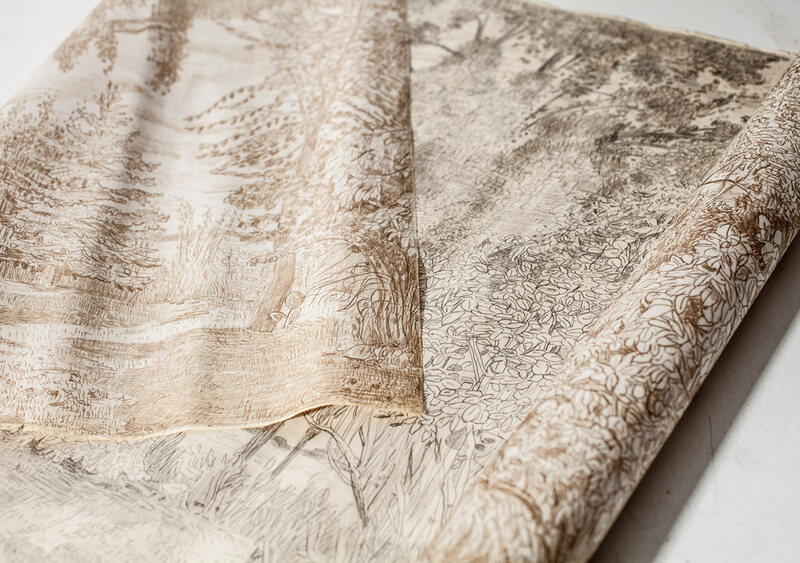 Nancy Friese, Still Grove (2016), detail of the front and back of the drawing showing the brown soft ground transfer. Friese describes herself as a “painter/printmaker,” using the term Adam Bartsch (1757–1821) adopted to emphasize printmaking’s role as an original creative domain.2 Like past masters of the landscape print, from Rembrandt in the 17th century to the Barbizon School in the 19th, she works from direct observation and eschews exotic locales in favor of familiar places, valorizing the beauty of the intimately known. She looks especially to the example of the 19th-century American printmaker Mary Nimmo Moran (1842–1899), who often sketched directly on a copper plate en plein air and also employed innovative etching techniques in her depiction of nature. While acknowledging this historical lineage, however, Friese does not adhere to a conservative understanding of landscape. The careful topography, the tight cropping and the gestural sketchiness give the work a diaristic quality that calls attention to the durational aspects of its making. We understand not only that someone sat in this place, but that she did so for a long time and that this time and place exist as specific moments within a larger framework—there is a before and after, there is land to the east and west. Still Grove conveys more than a scenic view of one particular woodland—it harbors a story that begins with Friese’s annual departure from her house in Rhode Island, her return to a place she considers “home,” her meditations on natural vistas she has known her whole life, and her attentiveness to the ways those vistas confirm or depart from her memories. Nancy Friese, Still Grove (2016), drawing over the soft-grounded copper plate with pencil, colored pencil, blue and black pen on newsprint, 24 x 48 inches. Friese allows us, sitting with magazine in hand, to glimpse the freedom of open spaces and the emotional validation of a place long known. The spill of the image across the two-page spread echoes at a small scale her panoramic view of the land, and allows us to share her pleasure in looking. On the verso we can see the soft-ground transfer on the back of the newsprint drawing—the link between hand and print—and can follow the translation from perception, to conception, to final image. The work is better understood through the act of turning the page. In this act of prolonged attentiveness, Friese alerts us to the value of this plot of earth in North Dakota, a place at a great distance from the urban hubs of the art world. One of Friese’s repeated subjects is the line of trees she planted to slow erosion and reduce flooding, a reminder that landscape is never static: it changes with the seasons; things appear and disappear from year to year; and dramatic alterations take place at the hand of both man and nature. In recording a specific site in a specific month, Friese nonetheless meditates on the past and the present, conveying the wonder of a comfortable and familiar place, even as it becomes defined by distance. Become a subscriber or purchase the issue individually to get your copy of Market Forces. Subscriptions start at just $38 and include instant access to our digital archive.